Drag and Drop can be used in ICEfaces to provide GUI features previously only available in traditional desktop applications. In this tutorial we will begin with making a simple Panel Group draggable and attaching a dragListener to communicate with a simple backing bean. We can then make use of Drag and Drop values to record specific data to the backing bean. Drag and Drop masks will reduce unnecessary communication over the ICEfaces bridge and improve efficiency. 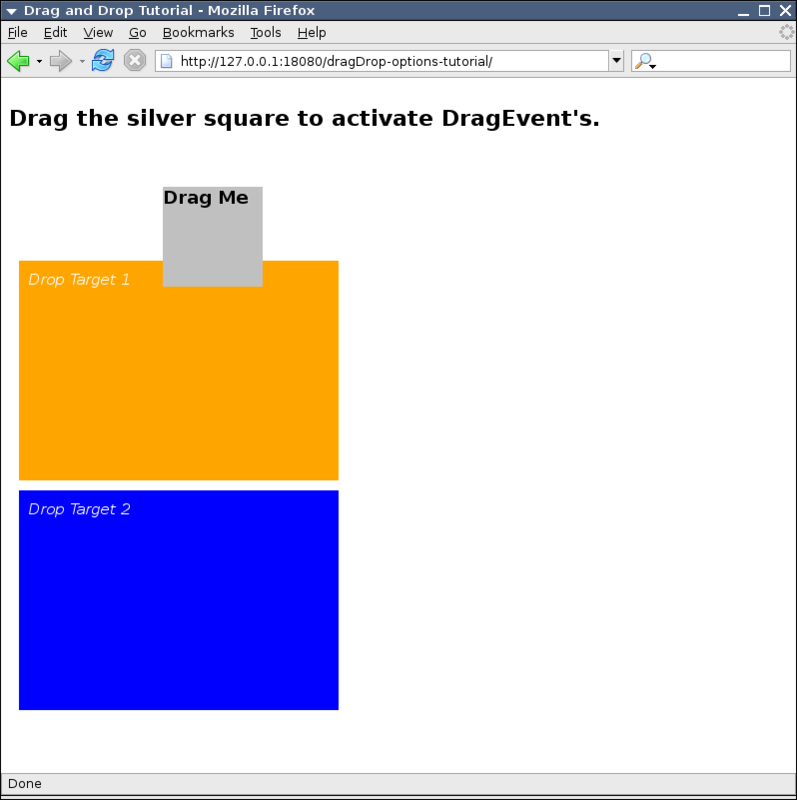 Drag and Drop options affect the behaviour of the dragging and dropping itself. Drag and Drop functionality can be added to any Panel Group. These Panel Groups can contain arbitrary ICEfaces components, but simply using images or text is typical. A note about the Z-Index: for typical purposes, Draggable Panel Groups should not be obscured by other elements on a page. To avoid this, you can set the Z-Index in the component's CSS style to an arbitrary high number. We can add some style information and fix the size of the panel to avoid scrollbars introduced with moving a Panel Group that is 100% of the page width. Setting Z-Index ensures that the Draggable Panel is not obscured by other block elements. A background colour makes the outline of the Draggable Panel easily identifiable and distinct from other elements. Finally, the addition of cursor:move to the style will change the mouse cursor to indicate that the Panel can be dragged. style="z-index:10; width:100px; height: 100px; background-color:silver; cursor:move;"
In addition to a Draggable Panel, we can add Drop Target Panels. 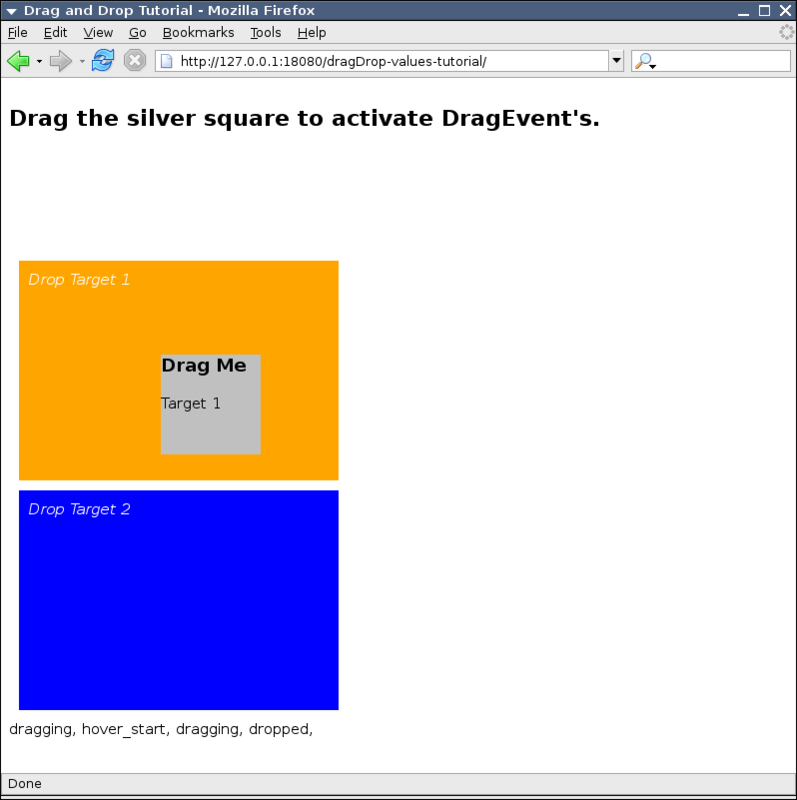 When a Draggable Panel is dropped on a Drop Target Panel, the "dropped" DragEvent will occur. These Drop Targets will also allow the remaining DragEvent's to occur. Download the dragDrop-basic source code here. 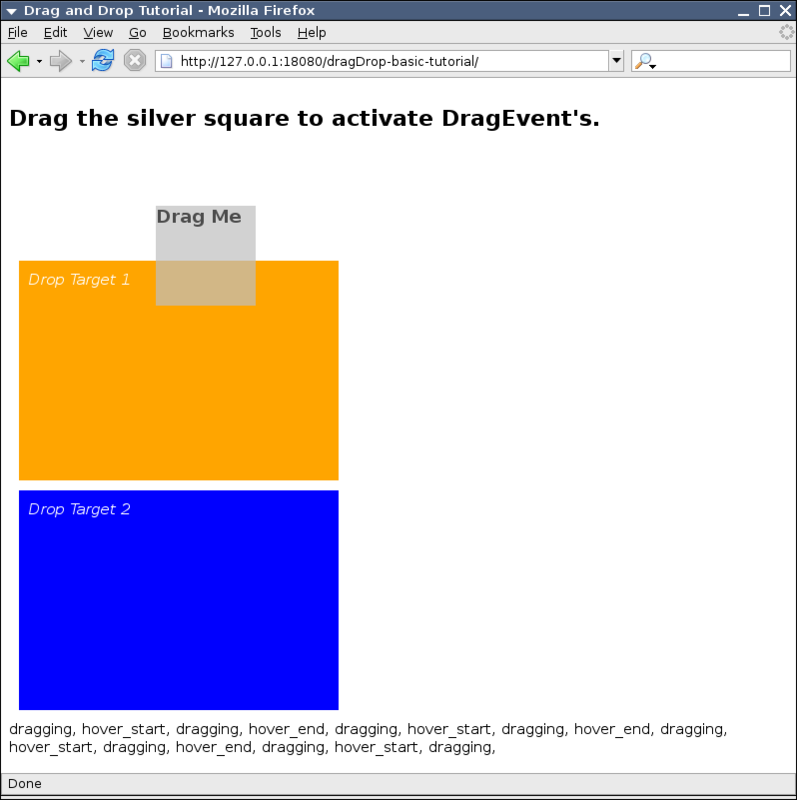 Drag the square to cause Drag and Drop events to occur. Each event type will be appended to the message displayed at the bottom of the page. Download the dragDrop-values source code here. Dropping the Draggable Panel on the Drop Targets will assign the stored value. 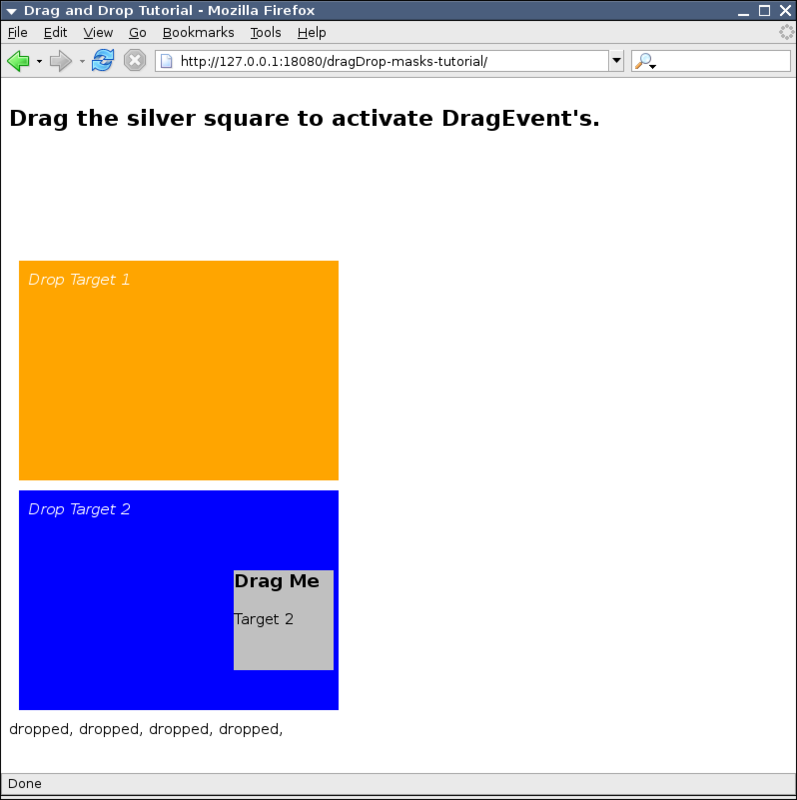 draggable="true" dragMask="hover_start, dragging, hover_end, drag_cancel"
Download the dragDrop-masks source code here. revert - when a draggable is dropped the draggable will move back to it's starting position. ghosting - when a draggable is dragged a ghost copy is left in the original position. Download the dragDrop-options source code here. Component Showcase Available in release bundles Drag and Drop example illustrated by a store where items can be dragged to an icon to add them to a cart. Webmail Available in release bundles Messages can be dragged and dropped to folders. dragDrop2 Available in release bundles (tutorial) Simple drag and drop example.